GoGameGo is a browser hijacker and Potentially Unwanted Program (PUP) created and marketed by The Whiz Ltd. It is endorsed as a Google Chrome New Tab for the people who are into gaming, as this enables quick access to the newest and most popular games. However, security specialists highly question its performance since GoGameGo toolbar has been found spreading by bundling and altering Chrome’s settings without PC’s user’s permission. Once downloaded and installed, it not only injects the toolbar but also replaces startup page and search site with http://search.mysearch.com, as well as drops tracking cookies to monitor user’s web browsing activities. How does GoGameGo infect your PC? Most of the browser hijacking program comes bundled with other free software. 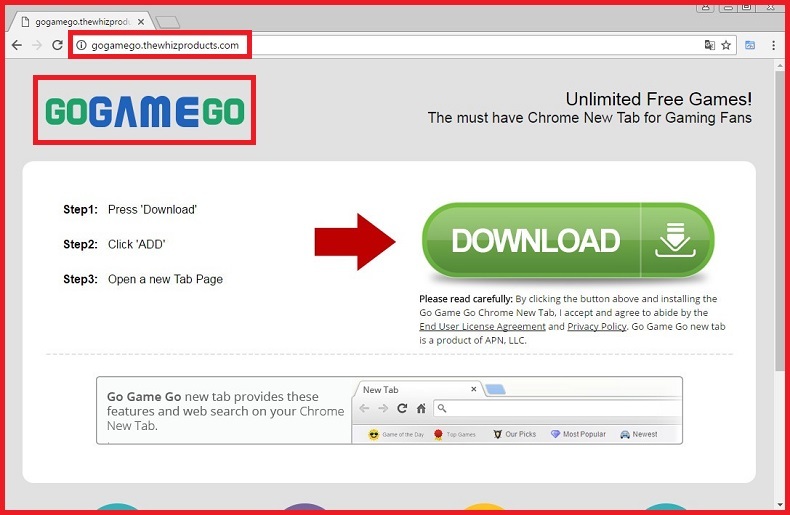 GoGameGo toolbar also comes as a browser hijacker gets downloaded and installed along with programs that you recently download from the Internet as a free bee. Although we are living in a high tech digital and internet era, but such viruses still manage to sneak in with advanced hiding techniques. Victims are first targeted with an email containing a malicious word file as an attachment. As soon as the attachment is opened, it activates an executable. Keep a check on such file extension – a file should not end with .exe only if it is a program or an installer either one of them. Any email seen with the invoice.exe definitely doesn’t belong to a work-related file, instead it is a virus that is made to look like one. Free programs or programs downloaded from torrent or online shared sites are in most cases the carriers for different browser hijacker. In most of the scenarios these programs projected as free but in reality they include adware programs, which includes browser hijackers, whose main aim is to generate revenue for the developer when they are installed. CDs and DVDs is a thing of the past. The trending devices are Jump drives or flash drives. Such foreign media may carry such infections. Make sure to use such device post scanning them with an Antivirus. Mentioned below are few tips to minimize the risk of browser hijacking and protect your personal data while online. Regularly update your browser software regularly. The updatation in many cases, software updates will feature responses to specific bugs, hacks or intrusions. Always have robust security software – there are many anti-virus software these days in the market which come as paid and free version. Paid version is always a better deal. If going for a free version make sure it’s from a reputable site and read between the lines– you may accidentally agreeing to install malware if you skip over the end user license agreement (EULA). Unknown Emails form unknown sources should never be opened as there is a high possibilities for embedded virus. Avoid giving your personal information unless you’re sure who’s asking for it. You may get calls from some random banks and financial organizations posing as the real one, but beware will never ask for private data online. Precautions and Suggestion to remove GoGameGo toolbar? If you have installed any new freeware software or game recently ,make sure you go through the license agreement section and read all the terms and conditions. Here we would like to suggest Malware Crusher as the best removal tool to take care of all your technical issues. If reading terms and condition is time consuming specially while installing the freeware opt for “custom and automatic installation,” it is always recommended that you go with this option as this makes it sure that all the unwanted programs gets shut down that might get installed along with it. So to secure all these issue use the best antimalware tool called Malware Crusher.